Office of the Secretary of Defense The Office of the Secretary of Defense (OSD) is the principal staff element of the Secretary of Defense in the exercise of policy development, planning, resource management, fiscal, and program evaluation responsibilities.OSD includes the immediate offices of the Secretary and Deputy Secretary of Defense, Under Secretaries of Defense, Director of Defense Research and Engineering, Assistant Secretaries of Defense, General Counsel, Director of Operational Test and Evaluation, Assistants to the Secretary of Defense, Director of Administration and Management, and such other staff offices as the Secretary establishes to assist in carrying out assigned responsibilities. Acquisition, Technology and Logistics The USD(AT&L) is the principal staff assistant and advisor to the Secretary of Defense and Deputy Secretary Defense for all matters concerning acquisition, technology, and logistics. Comptroller Manages and controls the budget and financial management policy of the Department of Defense. Director, Operational Test and Evaluation DOT&E is responsible for issuing DoD OT&E policy and procedures; reviewing and analyzing the results of OT&E conducted for each major DoD acquisition program; providing independent assessments to SecDef, the Under Secretary of Defense for Acquisition, Technology and Logistics (USD(AT&L)). Office of Policy The mission of the Office of the Under Secretary of Defense for Policy is to consistently provide responsive, forward-thinking, and insightful policy advice and support to the Secretary of Defense, and the Department of Defense, in alignment with national security objectives. Science and Technology The Assistant Secretary of Defense for Research and Engineering (ASD(R&E)) provides S&T leadership throughout the Department of Defense; shaping strategic direction and strengthening the research and engineering coordination efforts to meet tomorrow’s challenges. Installations of Environment Provide installation assets and services necessary to support our military forces in a cost effective, safe, sustainable, and environmentally sound manner. Logistics and Materiel Readiness The Assistant Secretary of Defense for Logistics and Materiel Readiness (ASD(L&MR)) serves as the principal staff assistant and advisor for logistics and materiel readiness in the Department of Defense (DoD) and is the principal logistics official within the senior management of the DoD. It Prescribes policies and procedures for the conduct of logistics, maintenance, materiel readiness, strategic mobility, and sustainment support in the DoD, to include, supply, maintenance, and transportation. Systems Engineering (ODASD(SE)) Develop and grow the Systems Engineering capability of the Department of Defense—through engineering policy, continuous engagement with Component Systems Engineering organizations, and substantive technical engagement throughout the acquisition life cycle with major and selected acquisition program offices. Technology Transition (OTT) The Office of Technology Transition (OTT) is responsible for formulating policies and establishing and managing programs that transition advanced technologies from R&D to weapon systems in an affordable manner. OTT also has a mandate to assist in the commercialization of defense technologies. Defense Programs The mission of the ASD(NCB) is to drive the capability to prevent, protect against, and respond to weapons of mass destruction threats. Networks and Information Integration/Chief Information Officer (NII/DoD CIO) provides management and oversight of all DoD information technology, including national security systems. 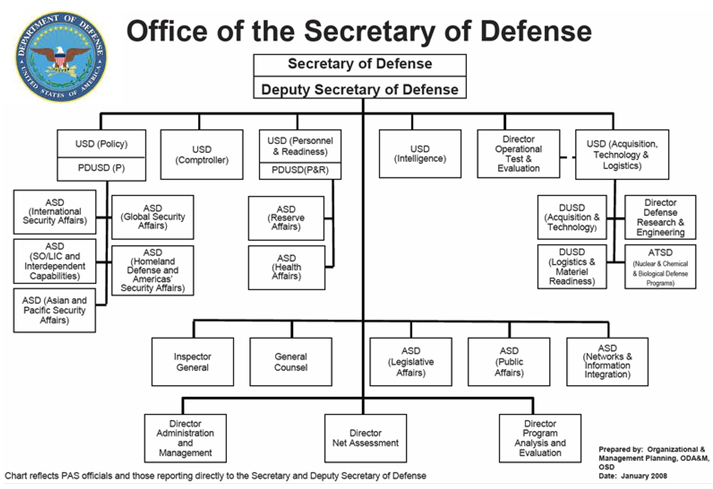 The ASD(NII) also serves as the Chief Information Officer (CIO) of the United States Department of Defense (DoD), a position distinct from the ASD and governed by the Clinger-Cohen Act. Legislative Affairs The Office of Secretary of Defense for Legislative Affairs is responsible for providing support to the Secretary of Defense in his dealings with the White House, Cabinet Members, Members of Congress, and the Department of State. Cost Assessment & Program Evaluation (CAPE) The CAPE office provides independent analytic advice to the Secretary of Defense on all aspects of the Defense program, including alternative weapon systems and force structures, the development and evaluation of defense program alternatives, and the cost-effectiveness of defense systems. Defense Cost and Resource Center (DCARC) The DCARC, which is part of OSD Cost Assessment and Program Evaluation (CAPE), exists to collect Major Defense Acquisition Program (MDAP) cost and software resource data and make those data available to authorized Government analysts. Small Business Inovation Research & Technology Transfer The purpose of DoD’s SBIR and STTR programs is to harness the innovative talents of our nation’s small technology companies for U.S. military and economic strength. Maufacturing and Industrial Base Policy The mission of the Office of Manufacturing and Industrial Base Policy is to sustain an environment that ensures the manufacturing and industrial base on which the Department of Defense (DoD) depends is reliable, cost-effective, and sufficient to meet DoD requirements.